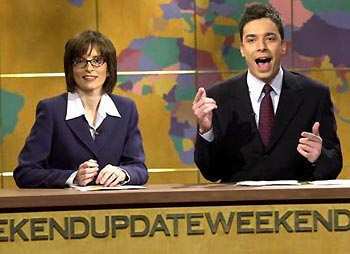 Growing up in the outskirts of Wisconsin, Tina Fey soon realized it as just wrong to be a Wisconsian. Crossing the border into Canada, she was greeted by comedic freedom, yet harsh Catholic persecution. Raised in a predominantly liberated "flower child" community of vegetarians, her first dream as a child was to consume the flesh of an animal. From there though, she realized comedy was in her blood, literally. Tests revealed her blood to have a higher midichlorian count than even master Yoda himself. Strong with the force was she. Unfortunately, at the age of 7 months, she was far too old to begin the training, so she simply turned her abilities toward comedy. At times it deeply depressed her to watch swarms of zygotes proceed onward toward Jedi status, but little did they know what fate was in store for her. Her abnormally high midichlorian count made her connection with Saturday Night Live an immediate given. The status of head writer was easily attained and efficiency reached an all-time high at the show as she found any "lack of faith disturbing". Legal and ethical questions (and unexplained strangulation) aside, the show suddenly became a hell of a lot funnier. And we had Lord Fey to thank for it. Brother Jacques: Now, I read in your bio that you�re the first female head writer that Saturday Night Live has ever had. But what exactly does that mean, to be "head writer"? Does it mean you�re just funnier than all the other writers? How does one in fact become "head writer"? Tina Fey: I simply challenged the authority of the previous writer and bested him in hand to hand combat. Tina Fey: I then devoured his brain, gaining his wisdom and wit in the process; the spirit of his humor and that very essence of what it is to be funny. Brother Jacques: By the way, I watched you do that thing you do on Saturday Night Live. You also do that news segment now, where you makes jokes about things and they�re funny because it�s all true. You know what I�m talking about, right? Tina Fey: Yeah, that thing. Brother Jacques: I was watching the show the other day. What�s that other guy doing there? Do you know he�s just hanging around there? Why is that other guy wasting my time? Tina Fey: Oh, that guy. Brother Jacques: Is he supposed to be nearby just in case you need something? Is that why they worked him into things? He talks way too much. Isn�t he supposed to be getting you coffee or something, and why isn�t he doing it? Tina Fey: Yeah, don�t worry about that guy. It works best if you just ignore him. Brother Jacques: Yeah, I noticed. It seems to space out the laughs. Tina Fey: As a child, mother used to tell me a story about my infancy. Two snakes once crawled into my crib and I snapped them both with my bare hands. Brother Jacques: Where do you see your unique brand of comedic genius taking the show in the future? Tina Fey: I see it reaching a peak of comedic brilliance in the near future. A problem I intend to remedy is the fact that monkeys were never truly utilized to their full potency on the show. Brother Jacques: You mean like people dressed in monkey suits, or the kind that fling their own poop? Tina Fey: In a sense, aren�t they both just one and the same? Brother Jacques: Now that you mention it... yeah. Tina Fey: Working with live, wild animals is always a hoot. There�s always that element of surprise. It really builds one�s knack for improvisational comedy, brings out the best in you, and keeps you on your toes. Brother Jacques: While you�re dodging poop. Tina Fey: Yes. Always dodging poop. Brother Jacques: Golly. I�ve got to tell you, I suddenly have a great respect for all you guys must have to go through over there at Saturday Night Live to keep us laughing day in and day out. Tina Fey: Only on Saturdays. Brother Jacques: Yeah. And that constant edge you guys must always balance along. The one between hilarity, and monkey poop. Tina Fey: But in a sense, aren�t they both just one and the same? Tina Fey: It stinks, but someone�s gotta do it. Brother Jacques: Any last words you want to leave the reader before we sign off here? Tina Fey: Women can do anything men can do, only better. Brother Jacques: Except pee for distance. Tina Fey: Wanna go right now? Nothing was more exhilarating than my all too brief chat with Tina Fey. Agreeing we must in fact do it again sometime, we parted our ways, her to a high tower of comedic brilliance, and me to this vast toilet of ones and zeros. And so, I left that interview with one thought in mind: goats die all the time, and meat truly goes to the strongest.